I am one of those people who get intense food cravings, and cannot be satisfied until my craving is fulfilled. Just yesterday, I needed to have baked brie with green apple slices. And the day before, it was red velvet cake (specifically the red velvet with cream cheese frosting, not the whipped cream frosting). My food cravings happen pretty often, but the thing I crave for the most is by far: chocolate. The urge to eat chocolate strikes unexpectedly at any given time, and this time happened as I was at Mall of the Emirates. Just as my chocolate craving hit, I looked up to see a restaurant called Alison Nelson’s Chocolate Bar. With the word Chocolate in the title, I knew I couldn’t go wrong. I walked inside and noticed their bright interiors, smiling staff, and delicious chocolate displays, and had a good feeling I was in the right place. There was ample seating and we immediately got our menus and started perusing what chocolatey goodness to order. After flipping through the pages complete with mouth watering pictures, my chocolate craving was on overdrive and we decided to order dessert first. 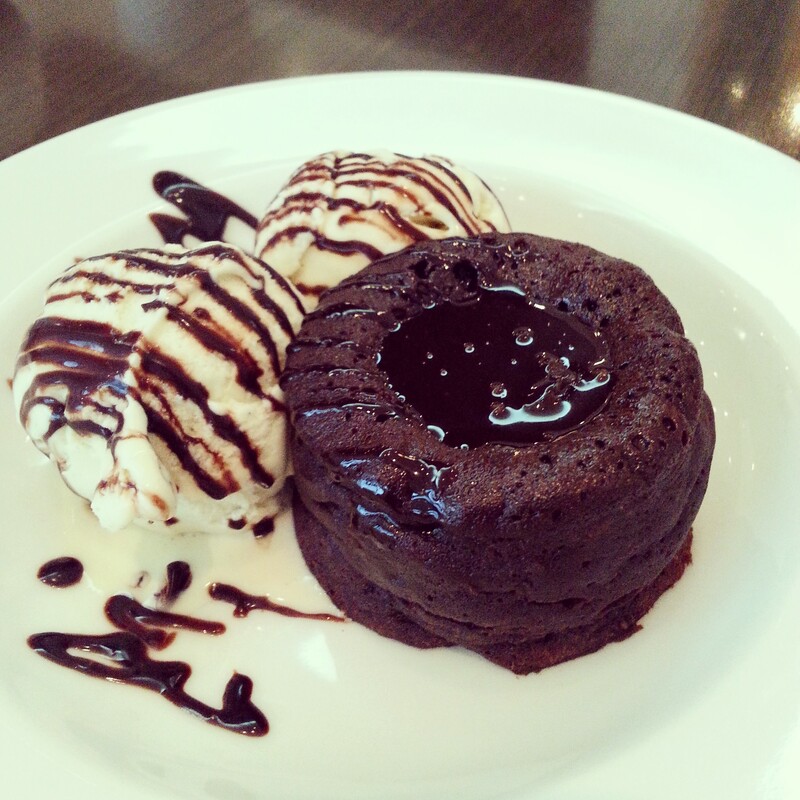 First to arrive was the molten chocolate cake, a warm moist cake with chocolate syrup and served with vanilla ice cream. I felt pure bliss as my spoon pierced into the cake and released the steam and chocolate syrup inside. 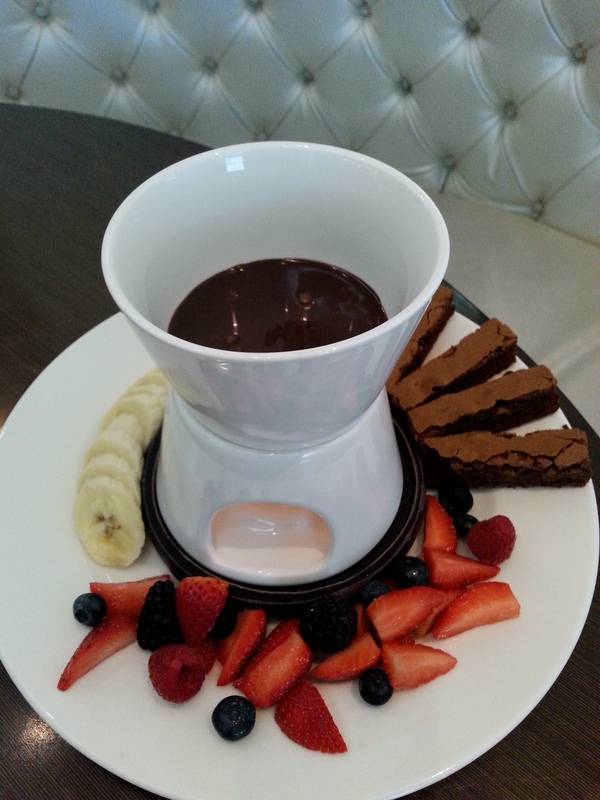 The next dessert to arrive was the chocolate fondue, a chocolate dipping sauce served with fresh berries, brownies and bananas. The fondue was not only delicious but also fun to eat! Dinner time was approaching, so I decided to stay and eat there. 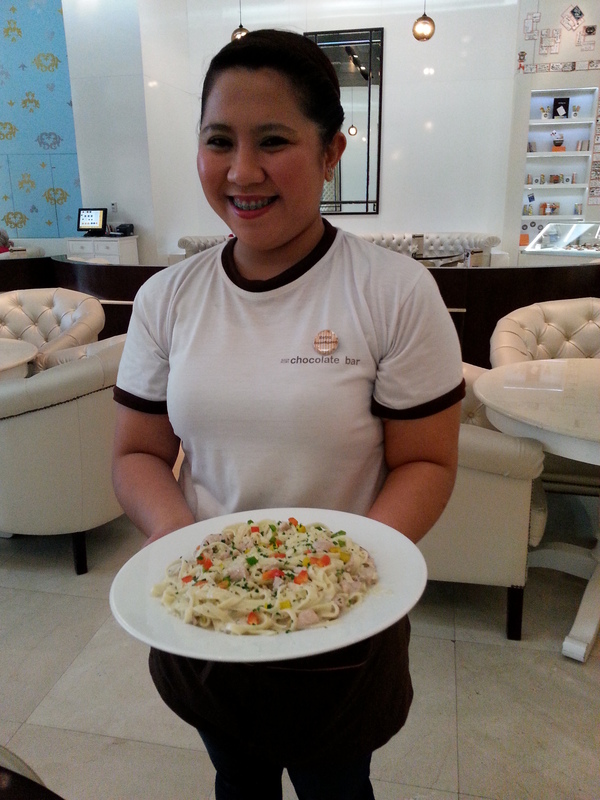 In addition to the many chocolates and desserts on offer, there is also a selection of savory foods such as salads, pastas, sandwiches and more. 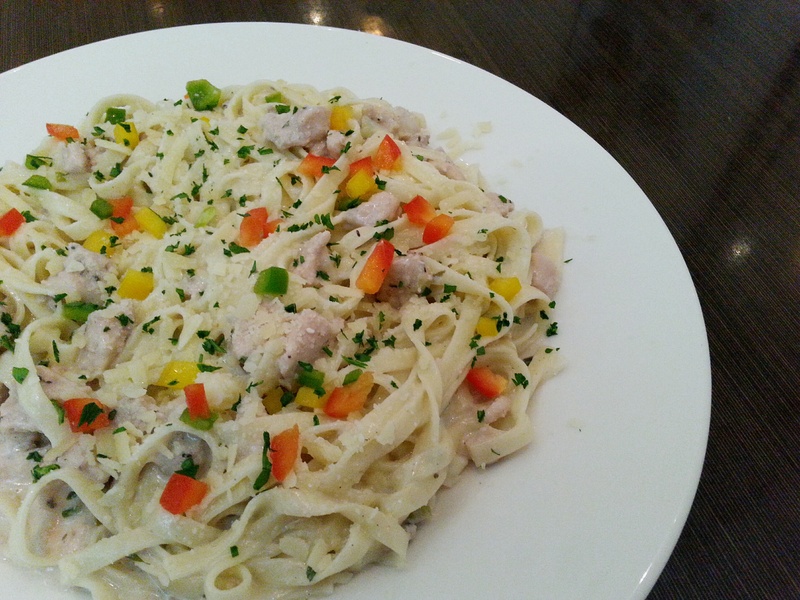 I was a bit hesitant to eat anything but dessert as I always thought of Chocolate Bar as a dessert place only, but the staff recommended the tagliatelle pasta and I was pleasantly surprised when it arrived. It was creamy and flavorful, with grilled chicken, veggies, and chopped herbs, and although it wasn’t amazing, it was tasty. In addition to the menu, there is also a range of chocolates and truffles, gift boxes, candy bars, and other fun paraphernalia such as t-shirts available for purchase. 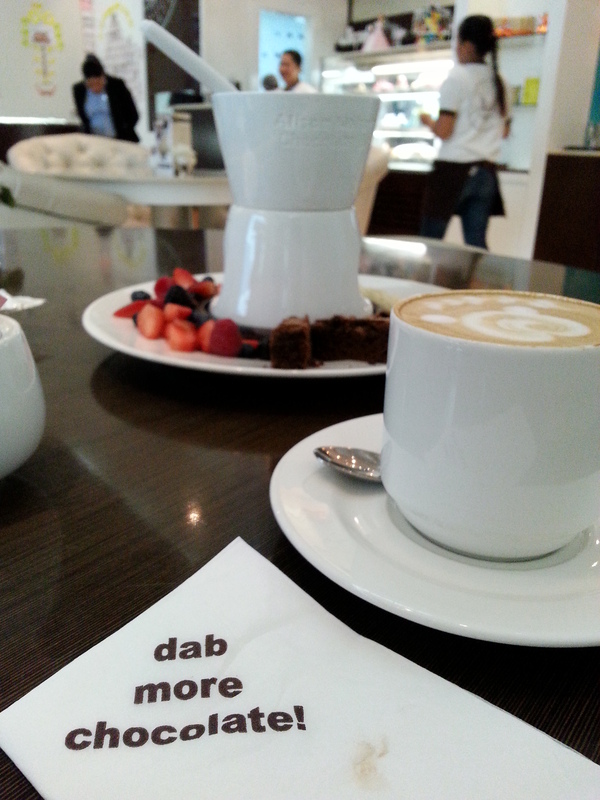 I finished my meal off with a cappucino, content that my chocolate craving was satisfied…until next time! 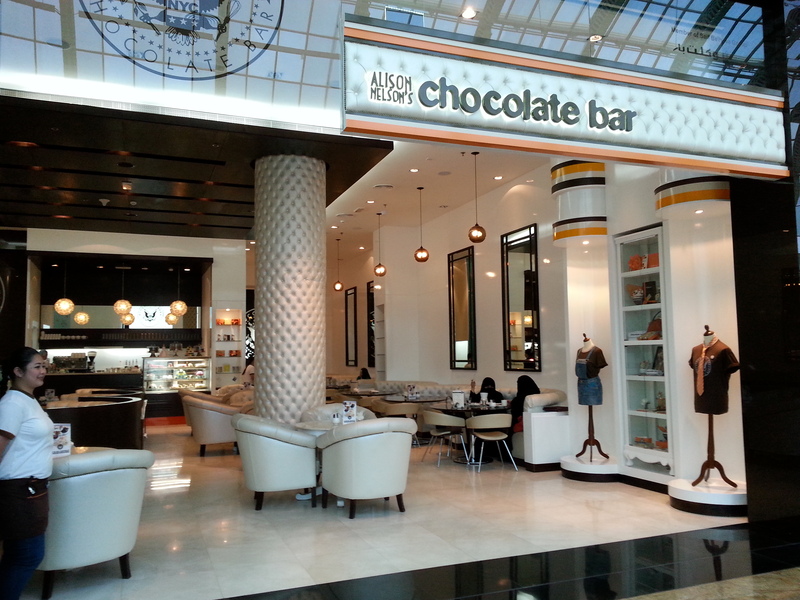 Alison Nelson’s Chocolate Bar has several locations in Dubai including Mall of the Emirates, Dubai Mall, Mirdif City Center and Mercato Mall. For a full list of locations and more information check here. Disclaimer: I was a guest of Alison Nelson’s Chocolate Bar.